Hopton's Almshouses were founded by Charles Hopton, who had died in 1730 leaving a large sum in his will, made 5 days before his death. 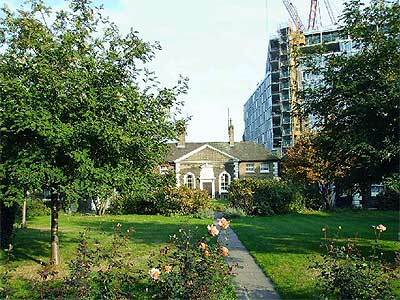 The interest was payable to his sister, upon whose death 9 years later, the residue of Hopton's estate paid for the erection of 26 almshouses for 'poor decayed men' of the parish of Christ Church in Southwark. In 1825 2 extra almshouses were added. The buildings are a group of delightful two-storey cottages of London stock brick with stone quoins. They almost enclose two simple garden squares, the first larger than the second, both have grass in the centre and are planted with roses and shrubs around the edge. They are a rare example of this genre of building and garden square in this area of London. Outside the gates is a Drinking Fountain and Cattle Trough. The almshouses were later rebuilt and modernised, re-opening in 1988, and they remain in use for housing owned by Anchor Trust. Rail: Waterloo. Tube: Waterloo (Northern, Waterloo and City, Jubilee, Bakerloo), Blackfriars (District, Circle), Southwark (Jubilee). Bus: 45, 63, 381. Charles Hopton was a member of the Fishmongers Guild, and his almshouses were founded for '26 (poor decayed) men endowed with house, a chaldron of coals and ten pounds in money each'. The total expenditure on the almshouses and grounds was about £2,700 but 'owing to a litigation it was not until 1752 [that] 26 poor men were placed in the apartments'. The site in Hopton Street, which lies between Blackfriars Bridge and the river, was described at the time as 'the cheapest, best and most convenient piece of ground that could be had for the building'. The almshouses were erected in 1746-9, designed by Mr Batterson, a trustee of Charles Hopton's will and a builder. Over the doorway to the committee room is a foundation tablet inscribed 'Chas. Hopton Esq sole founder of this Charity Anno 1752'. The almshouses opened in 1752 and the residents were also granted £6 per year and 32 bushels of coal. Early residents reflected the parish industries and included gardeners, watermen and fishermen. The almshouse rules prohibited 'resorting to alehouses', using 'railing, bitter or uncharitable speech' and swearing. According to the almshouse records, the gatekeeper was instructed to make a weekly report of the conduct of the residents. The first gas light was installed on the green by Phoenix Gas Light Company in 1830 and in 1835 paths inside the estate and pavement were re-laid with York paving and new front gates and railings were added. Behind the almshouses were 28 garden plots and a drying ground. During WWII Nos.1 and 2 and Nos.27 and 28 were demolished by enemy action in 1941. After the war the buildings were restored and by 1962 all the accommodation was re-occupied. The almshouses were modernised in 1988. Today the front garden comprises two squares of lawn with formal straight paths around the edge and down the middle of the larger square, with flower beds on the edges of the lawns. At the rear of Nos. 1-6 are 5 private gardens, with an informal communal garden with a pond and greenhouse at the rear of the rest of the development. The garden has been awarded Certificates of Excellence by the London Gardens Society under the Large Community Garden category in 1992 and 2004. Among the trees are 2 mulberry trees at the rear of No.14, a fig tree at the north-west corner and another at the edge of the eastern boundary, a Magnolia Grandiflora and a magnolia liliflora nigra in the north-eastern corner. Bridget Cherry & Nikolaus Pevsner, The Buildings of England: London 2: South (Penguin, 1999); John Beasley, 'Southwark Remembered', (Tempus, 2001); Southwark Listed Buildings data; Revd O. Bray & W. Bray, 'The History & Antiquities of the County of Surrey' E P Publishing n.d.; H. E. Malden, 'The Victoria History of the County of Surrey' (University of London); Edward Walford 'Old and New London' vol vi (Cassell & Co., c.1885/6); Robert W Bowers 'Sketches of Southwark Old & New' (William Wesley & Son, 1905); Clive Berridge 'The Almshouses of London', (Ashford Press Publishing, 1987); Almshouse documents.